1. Whisk red wine, syrup, garlic and olive oil. 2. Pour into large zip-lock bag. Add meat chunks, marinate in refrigerator for minimum 2 hours. 3. Remove from refrigerator and let stand for 30 minutes to reach room temp. 4. Skewer; alternating meat, onion and pepper. 5. 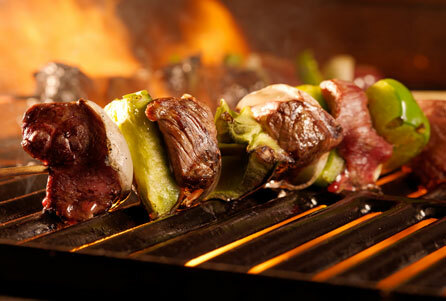 Sprinkle skewered meat and bell pepper lightly with Paniolo Grill seasoning. 6. Preheat grill to high. (Or, broil is fine). 7. Place kabobs on grill, grill a total of 14 to 15 minutes, turning every 4 to 5 minutes.